Many of the recipes I cook begin with garlic. I pound, peel, and crush garlic then let it sizzle in hot oil to start a soup, stew, tomato sauce, chili, and more. We grew garlic for the first time in our garden plot this summer. We planted the garlic last fall and harvested it in July. Now, in November we only have one garlic bulb left from that harvest. 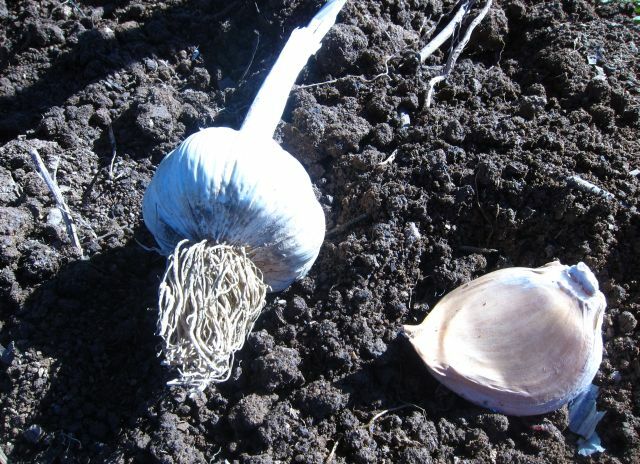 According to the Grow It Eat It Network garlic harvested in the summer can last until December. One of my husband’s garden goals is to be self-sufficient in garlic production. He purchased four California Select garlic bulbs and three Elephant garlic cloves for planting this fall. We hope next summer our garden plot will produce enough garlic to last until December with extra bulbs for next fall’s planting. Oh, simple garden pleasures….never needing to buy garlic bulbs for fall planting again! 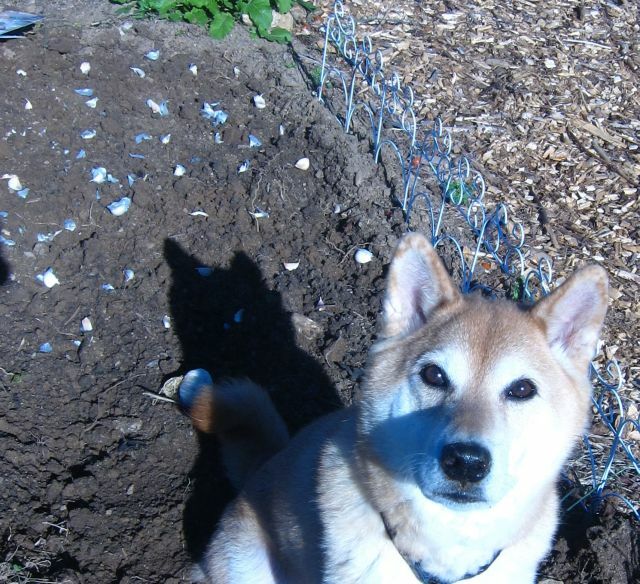 A few days ago our Shiba Inu dog, CJ and I planted the garlic cloves. While I shoveled and raked the dirt to prepare it for planting, CJ dug in the dirt to follow a scent and a fuzzy brown caterpillar. He helped loosen the dirt a tiny bit. I planted 5 rows of 9 garlic cloves (3 inches apart and 1 inch deep) and 3 Elephant garlic cloves (6 inches apart and 6 inches deep) for a total of 48 garlic cloves. The Elephant garlic is huge. It is almost the same size as a garlic bulb. We never planted this type of garlic before. I wonder how large it will be as a garlic bulb! We may have lots of extra garlic for next fall’s planting. Do you plant garlic cloves in the fall from your garlic bulbs harvested in summer? I love your dog! He looks so appealing. I’ve only ever grown garlic once, and it didn’t do well, but in retrospect I have realised that it was probably because I used bulbs I had bought in the supermarket, which are not really suitable for propagation. Will the amount you have planted really last you all year? We use such a lot of it in cooking that I would need half an acre to keep us going! BTW – thanks for visiting my blog. Hope to keep in touch with you, and compare notes… And Yes, the blanching did nicely sweeten-up the Endive, It was delicious, and there’s more to come! I made some corrections to my post. We want to be self-sufficient in garlic production. The garlic we harvest in summer can last until December. We hope to have extra for fall planting next fall. Our fresh garlic tastes better than garlic from the store. But will have to buy it during winter and spring. Thanks for your comments.